Ships from and sold by All-Hardware. 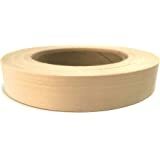 Edge Supply Brand Birch 3/4" X 250' Roll, Wood Veneer Edge banding Preglued, Iron on with Hot Melt Adhesive, Flexible Wood Tape Sanded to perfection. Easy application, Made in USA. Real wood veneer edging use to repair or enhance cabinetry, furniture, shelving, crafts, or any other flat or cylindrical projects. Size : 3/4" x 250'. Pre-glued with hot melt adhesive and easy to apply with a household iron. Finely sanded to perfection, can be trimmed and cut with scissors. With Internal paper core to keep the roll tight and straight to facilitate the application. Can be stained or applied any lacquer finish. Suitable to be applied to wood, plywood, particle board, hardboard, metal. Ships from and sold by WoodworkPRO. Ships from and sold by Horizon Hobby. 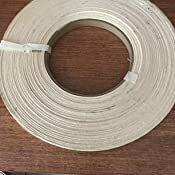 Edge Supply Brand Maple 13/16" x 250' Roll, Preglued Wood Veneer Edge Banding, Flexible Wood Tape, Easy Application Iron On with Hot Melt Adhesive. Smooth Sanded Finish Veneer Edging. Made in USA. 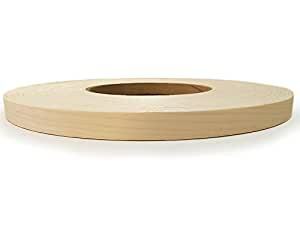 Edge Supply Brand Birch 1-1/2" x 25' Roll Preglued, Wood Veneer Edge Banding, Iron on with Hot Melt Adhesive, Flexible Wood Tape Sanded to Perfection. Easy Application Wood Edging, Made in USA. 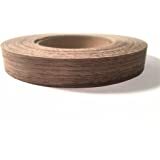 Walnut 3/4" X 50' Roll Preglued, Wood Veneer Edge Banding, Flexible Wood Tape, Easy Application Iron On with Hot Melt Adhesive. Smooth Sanded Finish Veneer Edging. Made in Germany. 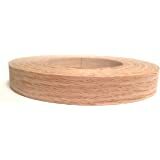 Edge Supply Brand Red Oak 3/4" X 250' Roll Preglued, Wood Veneer Edge Banding, Flexible Wood Tape, Easy Application Iron On with Hot Melt Adhesive. Smooth Sanded Finish Veneer Edging. Made in USA. 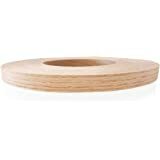 Edge Supply Brand Red Oak 3/4" X 50' Roll Preglued, Wood Veneer Edge Banding, Iron on with Hot Melt Adhesive, Flexible Wood Tape Sanded to Perfection. 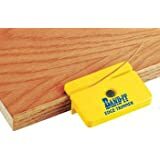 Easy Application Wood Edging, Made in USA. 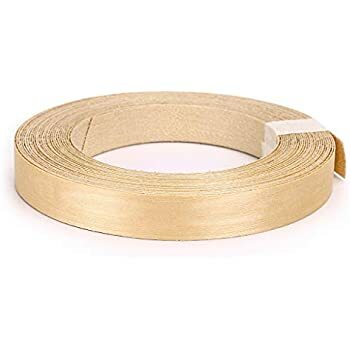 Edge Supply Brand Birch 7/8" x 250' Roll Preglued, Wood Veneer Edge Banding, Flexible Wood Tape, Easy Application Iron On with Hot Melt Adhesive. Smooth Sanded Finish Veneer Edging. Made in USA. This item Edge Supply Brand Birch 3/4" X 250' Roll, Wood Veneer Edge banding Preglued, Iron on with Hot Melt Adhesive, Flexible Wood Tape Sanded to perfection. 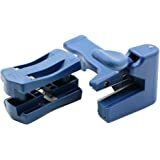 Easy application, Made in USA. 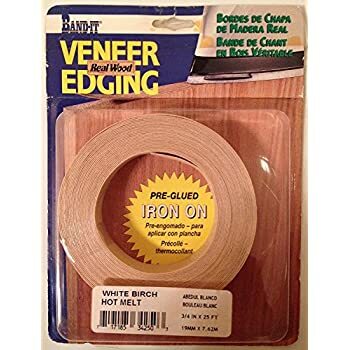 High Quality Wood veneer edgebanding Birch Pre-glued iron on, size 3/4" X 250' (With high quality adhesive) and finely sanded to perfection. The wood edge banding roll can be applied with an iron, hot air blower or it can be applied with an edgebander machine. 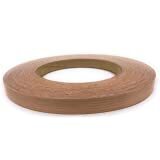 We offer the highest quality wood edge banding in the Market. We also offer many other wood species and sizes upon request ready for immediate delivery. An ordinary household iron is all you need to apply this premium hot-melt edge banding. 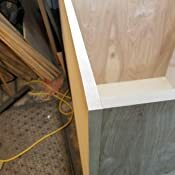 Just position the edging on the edge of your plywood or other substrate and smooth it with a few passes of an iron or slide it through an edge-banding machine. 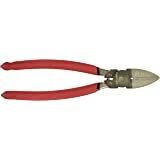 Suitable for straight-line edges as well as contours. Bandings are impregnated with a high-speed hot-melt glue that creates a permanent bond. They also are pre-sanded and readily accept stains and finishes. 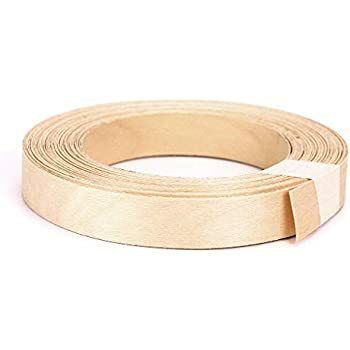 I purchased this banding to use on a furniture project. I used an inexpensive small travel iron to heat the glue, and it worked great. The banding stayed in place once the glue was activated, and we've had no lifting on the entire project since we completed it about 3-4 months ago. We finished it with a whitewash and a poly clear coat, neither of which affected the adhesion of the glue. There was close to a total of 150lf of banding on our project - all on plywood edges. Re-positioning during the project was no problem either; if we had a minor adjustment to make, we just ran the iron over the banding to heat the glue, and moved the banding to the correct position. Make sure to let it cool for several minutes before cutting or sanding away any excess material. Veneer was nice and clear, free of knots and other imperfections. Plenty of glue for good adhesion and it's applied uniformly so there are no spots without adhesive. The joints in the veneer are quite hard to see at first, and they sand down so well that they are virtually unnoticeable once finished. 5.0 out of 5 starsGreat adhesion-no separation in over 200 feet of edging applications! I have to say, the splices are almost invisible. That was my biggest worry. When ironing this on, it is important to realize the veneer shifts pretty easily when the glue starts melting. Since no plywood seems to be a full 3/4" thick anymore, this is slightly wider than the wood I was covering. Trimming it with a small plane works well, but check the grain direction so you don't accidentally gouge into your plywood's veneer. I finished the trimming with 120 grit sandpaper; it took a little longer, but it also eliminated slivers in the banding. I played around with the iron to discover it took almost 30 seconds of press time to get the perfect adhesion. Even at that 'long' press time, the veneer did not burn. At this point we have used 5 rolls (and need another). 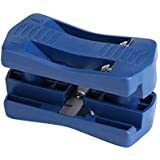 The quality is very good and the glue still has had no issues pulling or moving. We use it on Grade a/b plywood. 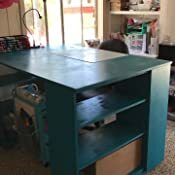 On inexpensive plywood (home depot 30$ a sheet stuff) we have had to ... slow down...and take our time with the glue but it always sticks. (ie get it very hot and force the glue into the wood pores with the edge of a piece of wood). We have seen some "short splices" in the 3 foot range. Both those items are very picky as I have seen 200$ a roll edge banding that doesn't perform as well as this. We are very happy with this product. And Hope it sticks around for a long time. We have used a roll and have another on order. The veneer itself is of good quality. We have seen virtually no pitting or joints in it. It stains well and accepts paint well. We have generally been applying it directly off the roll without straightening. 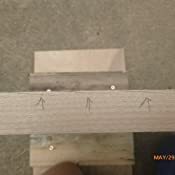 (you can use the edge of a table to take the bend out of veneer like this) When applying it has a tendency to wander a little more then other edge banding we have used but it is easily heated and adjusted into position so really this is a non issue.Edge trimming works as you would expect. 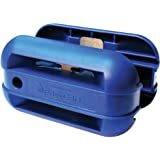 We have only had the cabinets that are made using this product in service for a short time so I can not comment on long term adhesion/quality. But there are no indictions of it pulling or moving yet. All in all a good product for a good price. I was wondering exactly which width to order for 3/4 plywood since today’s plywood not really 3/4” wide. Turns out that the 3/4 edge banding is perfect in that it just barely extends over the edges on both sides. Most of the time you don’t even need a trimmer for the edges as sandpaper will even it up pretty quickly. As far as the banding itself goes, the roll I got does not have excessive finger joints. I did notice that it’s a bit shiny in spots that can affect the finish quality, but over all I’m happy with it, especially for the price. 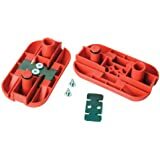 I have ordered this item 5 times in a short period of time (tons of shelves). Every roll has been flawless. Price is 1/2 what it is local and far superior in quality. The grain is arranged pretty straight so trimming is not a problem. The stuff i got local was so windy that it wanted to tear into the finished face and was a slow going nightmare. This company does a great job with quality control and consistency. 5.0 out of 5 starsQuality veneer edging. I made a cardboard box just slightly larger then the spool of veneer with an opening on the edge. I am able to pull the veneer tape out with ease to just the correct length and keep the roll intact. 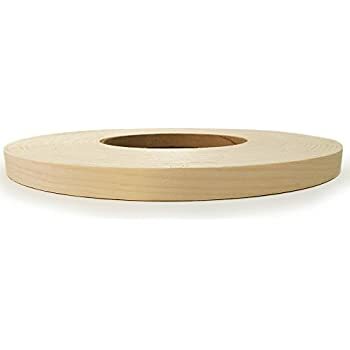 I bought this because of the 3/4" width, since plywood is 11/16" and most edge banding is 7/8" for that size of plywood. This is not a continuous 250' roll. I found ends taped (not spliced) together in two places, and I only used about 1/4 of the roll. So I ended up with random lengths because they didn't fit the particular piece of plywood. The worst was the splits at the edges, there were a lot of them. I marked the direction to trim to try to avoid splitting the banding when trimming. I'll go back to Woodcraft for edge banding. 3.0 out of 5 starsGood enough for the girls i go out with..